The Secret Carpet Club presents three well-established folk musicians, deeply rooted in their local traditions and, not least, in their own individual musical expression. Guitar, fiddle and various flutes weave together to make a rich, rhythmic and dynamic musical fabric, with Emma’s voice in the foreground and Carl and Vidar providing the harmonic background. Songs and instrumentals are here in equal measure. The material is mainly from Sweden’s west coast, but a Norwegian tune joins the repertoire, along with tunes composed by the group’s members. The songs range from tender love songs, ballads and chorales to frisky sailor songs, cheeky comic ballads and a shout out over the ocean to missing sailors. The instrumentals offer a variety between warm, rich and sprightly polskas, to calm romantic bridal tunes. With their debut album, Village, The Secret Carpet Club invite the listener into their living room, onto their carpet, in their musical village somewhere between Norway and Sweden. It is a warm, dynamic album, glancing sentimentally backwards and a flirtatiously sideways to the west. With its pulse and atmosphere, Village represents a heartfelt and playful contribution to Scandinavian folk music, eager to please the ear and get the foot tapping. Emma Johansson – vocals and flutes, Carl Nyqvist – fiddle and backing, and Vidar Skrede – guitar and backing vocals. 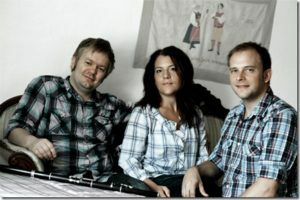 The three musicians met as master students in Nordic folk music at the Royal College of Music in Stockholm in 2008. Drawn to each other’s playing styles and to the results of the unique musical chemistry that arose between them, they founded the trio The Secret Carpet Club. Since then, they have held concerts and toured around Scandinavia. In 2009 they released the EP Popular Music from Scandinavia. One of the four tracks, “I denna ljuva sommartid” is included on Village. Emma Johansson (from Gothenburg, Sweden) is a freelance musician as a folk singer and flute player. She has a master degree in performing. Swedish folk music at the Royal Academy of Music in Stockholm and has specialised in the West Swedish music traditions. Besides The Secret Carpet Club, Emma is known from bands like: Oleman (with Olof Misgeld and Anette Thorsheim), Tandoori Hill (with Petter Berndalen, Emma Reid and Bengt Jonasson), the international band Seaquins (with among others Ditte Fromseier Mortensen, Anna Massie, Mairearad Green and Emily Smith), Huggevill (with Görgen Antonsson from Draupner and Fomp and Jonas Olsson), Eter (with Sofia Karlsson, Anna Johansson and Leo Svensson). She has released several CD’s, such as “Eter – eter” 1998, “Huggevill – vid randen blå” 2006, “Tandoori Hill – Brave Shyness” 2009, “The Secret Carpet Club – Popular Music from Scandinavia” EP 2009, and as a solist together with Emma Reid on the CD “En stjärna gick på himlen fram” 2010, with “Lunds akademiska kör”. She has appeared on television and radio, among others on the TV show with Barbro Svensson “Lill-Babs” and on “Bröstcancergalan i Globen” with Katie Melua and her hit “Nine Million Bicycles”. Carl Nyqvist (from Lidköping, Sweden) is a coveted fiddler and tune writer, working as a freelance musician in addition to teach at workshops, seminars, courses and more. He has distinguished himself as a “riksspelman” (National Folk Musician of Sweden) in performing tunes from Västergötland, the area which he also has his musical background from. He has a master degree in Nordic folk music at the Royal Academy of Music in Stockholm, where he studied under among others Mikael Marin (from Väsen), Ellika Frisell, Arto Järvelä (from JPP) and Harald Haugård. Besides The Secret Carpet Club and various duo projects, Carl is heard in the band NOMAS (that released the CD “Flow” i 2009) and in cross over constellations like the bluegrass influenced band Bleeding Hearts and the folk-pop band Norrom. He has been heard in radio and television all over Northern Europe.